When our computer's operating system crashes or when we try to format it, it tries to open from the installed system, because it is usually the hard drive that is defined first from bios to boot. (Boot feature from Bios) I will tell you step by step how we do this definition. 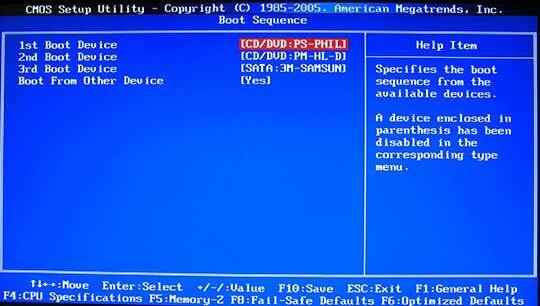 In order to access the Bios menu, we have to press the button that opens the bios during the opening of the computer. Although this key is defined specifically for each motherboard manufacturer, the Del key is usually in the majority. Some computers and computers may be DEL, F1, F2 and others may be F12. Since we provide access to the BIOS menu, we can move to the next step. When we open the BIOS Screen, a screen will come up and we will come to the Boot menu with direction buttons from this screen. In Boot menu, enter Boot Device Priority and enter 1st Boot Device tab. In the drop-down menu, click Removable Dev. If you have inserted a flash disk as a removable device and you want to start from this flash disk, you have to select it. If you want to start from CD / DVD rom, we should enter the CD-ROM on the device we selected. In this section of some BIOS menus, you can move up and down with the arrow keys. Now that we're done with this section, it's time to record the settings we made. You can save and exit with the F10 key in the current section, or you can save and exit from the Exit menu in the Exit menu. After this process, your computer will reboot and start from your device according to your chosen startup method.